You've got your costume sorted, you have the right wig and even props and weapons.....what's left? Well, how about the make up? You don't need to be a professional make up artist to achieve super realistic scary special effects. All you need is some supplies from your trusty local fancy dress shop (that's us!) and some patience and confidence. There are hundreds of helpful tutorials out there on the internet - try searching on youtube or pinterest. I have picked out some of the simplest, most effective make up tutorials here. Why not try them out this Halloween? Skeletons are a Halloween classic - but if you want to avoid wearing a hot, uncomfortable mask all night why not try out some face paints? Day of the Dead has increased in popularity hugely over the last few years. It is a more colourful way to do a skull and you can let your own creativity go wild with your choice of colours and patterns. This look will never go out of Halloween fashion and has only increased in popularity since the hit show The Walking Dead premiered in 2010. The best thing about doing a zombie look is how easy it is - it doesn't matter if it's messy, in fact it's better if it is! Vampires are another Halloween standard, yet there are so many different ways they have been portrayed! Buffy, Twilight, True Blood, Interview With A Vampire.....each with different versions and folklore for their vamps. Before all of those newcomers came arguably the quintessential bloodsucker: Count Dracula! Heath Ledger's astounding performance as The Joker in The Dark Knight earned him an (sadly posthumous) Oscar and ensured this will be an iconic look for years to come. Halloween doesn't have to be all blood and decay! Why not try something less dead and more surreal? 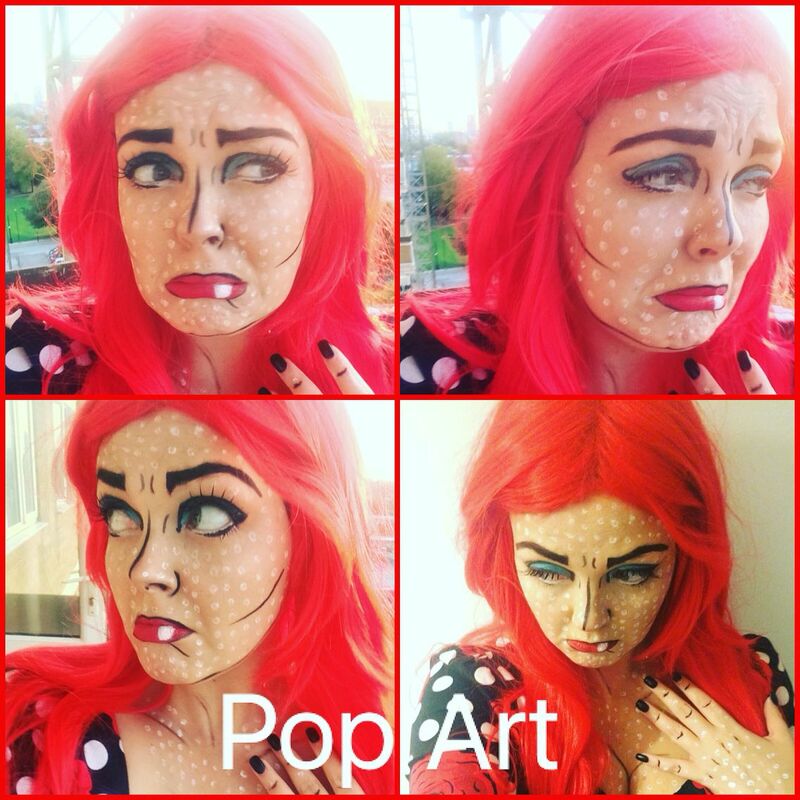 This pop art look is super fun! It's so easy even our staff can do it! As seen below! Will you be trying out any of these looks? Don't forget we stock most of the products needed- e.g. full range of face paints, liquid latex, scar wax, fake blood and a lot of the looks can be done with regular cosmetics such as eyeshadows and lipstick!